While most of us spend time on the role of colonialism, and the 19th century Scramble for Africa as a cause of the war, we rarely spend much time on the continent after the outbreak of war. There is some mention of North Africa vis-à-vis the Ottoman Empire but there is little consideration of the Sub-Saharan region. The Germans maintained colonial empires on both coasts but they tended to be poorly defended. When war broke out the Allies took advantage of war to try and gain colonies almost immediately but their successes did not take place evenly. Arguably the most entertaining story of the war in Africa is the tale of the elusive German Lieutenant Colonel Lettow-Vorbeck who was given the task of escalating the fighting in Eastern Africa in an attempt to draw forces away from the Western Front. This tactic had the desired effect, and the British dispatched reinforcements in 1916 to assist South African general Jan Smuts in defeating Lettow-Vorbeck. By some accounts, the Allies needed close to 1 million people to fight against German resistance (400,000 Europeans and 600,00 Africans) so the German strategy of attrition continued to work. However, it wasn’t the diversionary success that the Germans had hoped for: Lettow-Vorbeck’s strategies did not have lasting effects: rather than diverting forces from the Western Front, the British in particular began to use African troops in the battles against the Germans. Nonetheless, this episode in World War I demonstrated that guerrilla warfare and elusive tactics were effective against a much larger enemy. How did the war in Africa affect the overall outcome of the war? 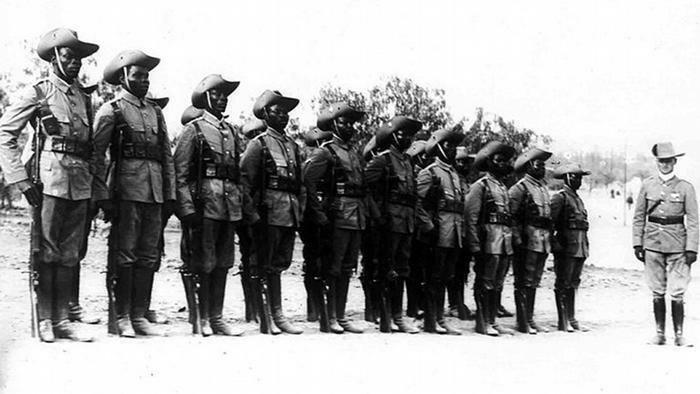 How did the war affect nationalist movements in Africa? Were there differences between the different colonial powers in their outlook towards the use of colonial Africans in the war? Why do you think those occurred? This is a very basic introduction to the Great War in Africa, meant to get you thinking about it. If it interests you, you may wish to consider this as an IA topic, or a subject for future research and study.